if I didn’t get around to leaving a comment for you. I am up to my neck in alligators right now. I am always impressed by the talent and creativity of bloggers and it’s so much fun to see what you have to share each week. This weeks features are a prime example…..enjoy! 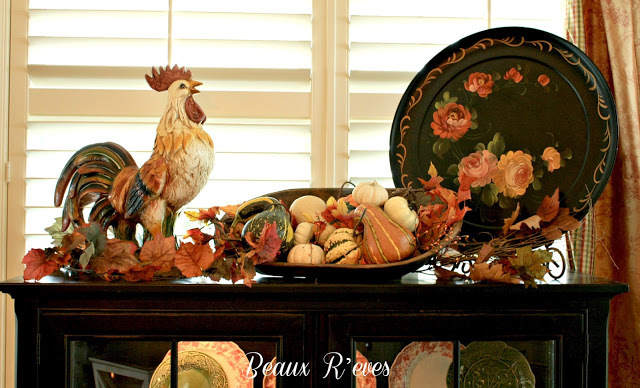 Cindy @ Beaux R’eves Fall decor in her kitchen and hearth room is beautiful. 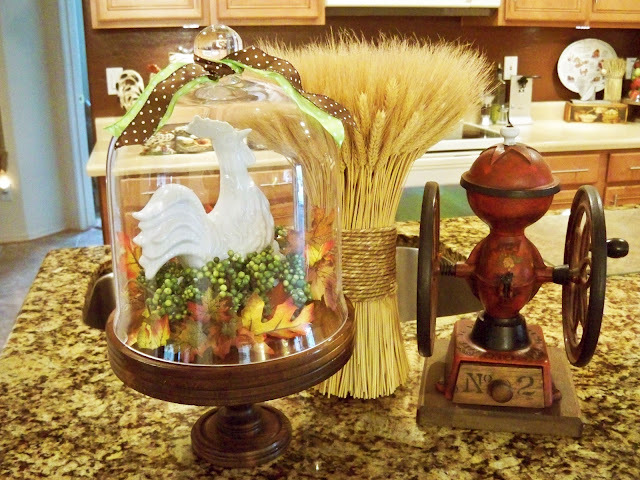 Janette @ The 2 Seasons has been taking lessons and she painted this adorable rooster. and I know she would love for you to join the party at A Stroll Thru Life. beautiful vignette in their orchard. gift card and thank Appliances On-line for sponsoring the giveaway. Congrats to Linda @ Coastal Charm. I’ll be sending her an email shortly. UUUUUuuuuuh, where is the party link, sugar????? I am gradually taking on those duties, medicare, insurance, doctors, etc, and my head is spinning. I feel for you! Great features Sherry! Thanks so much for hosting! Hello Sherry, I hope things are going well for you. Thanks for the lovely features today, I love visiting here. 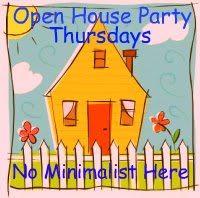 Sherry, Thank you so much for hosting the Open House party with everything else you have going on in your life! Congrats to Linda for winning! And thank you for hosting! Beautiful features. I just linked up, will be back later tonight to visit. Thanks for hosting. That outdoor Fall vignette is sooooo PRETTY!!! Thanks again…I have already started to look around. Thank you Sherry for hosting once again. It's always fun to be here! Say hi to Dad for me. Love all your features with a special fondness for that charming painting. Sherry, these are lovely features! Thanks so much for hosting! Hope you're having a great week! Hey Sherry! I'm so glad to see you here! You've been missed! I bless you for being there in Florida taking care of your dad–I'm sure it's hard being in the hot weather this time of year, but you're a champ to be there! So glad you are back Sherry. It sounds like you have a lot on your plate so it's nice that you have the time for this too! Thank you so much for hosting! I hope you get everything all straightened out soon! Sherry, so sorry for what you have to deal with! It's hard when you get our age and have to deal with your aging parents. God Bless you! Thanks for the feature and for hosting! Hugs! How kind of you to keep the party going despite all you have been dealing with. I enjoy the great ideas and inspiration from so many talented bloggers! Thanks so much for hosting us Sherry! Thank you Sherry for hosting your party this week. So sorry for all you are dealing with at this time but please know that you are not alone and that you are being kept in so many prayers. Hang in there. JUST THE WORST…DEALING with insurance. Good luck. Wish I could give you a hug. Hi, Sherry! So glad to be able to party with you this week! Thank you! Sherry, I'm thrilled for LInda. What a nice gift! Thanks for hosting again. This party offers lots of inspiration. Good morning and thanks for another link party! With the weather getting cooler, my dessert needs change. I want spicy cookies-but hate the calories. So, I came up with a Skinny Ginger Puff Cookie Recipe (#91) that satisfies those spicy cravings. They're made without shortening or sugar, but taste amazing. I hope you enjoy! Looking forward to getting through the links this evening when I have more time — thanks for hosting! I just found you and tried to join your list of follower's and keep getting the message: not found error 404. I did sign up for email, though…thanks for hosting this party.Looks like some great entries! Hello Sherry! I'm very happy joining your great party and visiting so many creative blogs. Good luck with your things. Hi Sherry! I'm late to your party but I'm getting to play! Thank you for hosting. Thanks for hosting – I am a little late this week! What a fun post and so full of wonderful blogs and ideas for visiting! Hi Sherry, I'm new to your blog and link party, and excited to join the fun. Your home and blog look beautiful and I look forward to continue reading and visiting often. Happily following.